I’ve been looking at tropical forests with fresh eyes on this trip, largely due to two books which I’ve been reading out here. The first, Second Growth by Robin Chazdon, is a compelling argument for the conservation of logged, degraded and secondary forests around the world. Far from being wastelands whose only worthwhile use is development or conversion to agriculture (hence the spread of oil palm), they should be viewed as valuable repositories of future diversity. Left to their own devices, or assisted when necessary, these forests can and will recover. It’s an important positive message regarding modern tropical landscapes. This isn’t to say that primary forests can be ignored — what remains still needs to be protected — but that regenerating forests have a crucial role to play in the future of conservation in the tropics. The second book is Ecology of Lianas which I’m reviewing for Frontiers of Biogeography (spoiler alert: it’s brilliant). 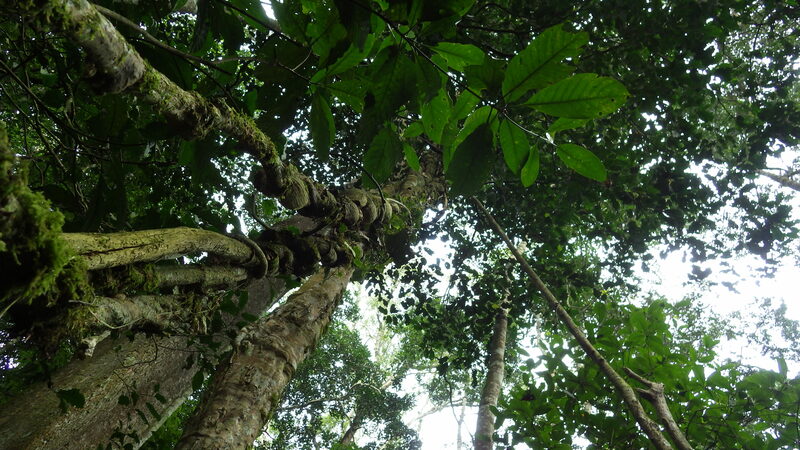 Lianas have been neglected for a long time partly due to the difficulties of measuring them, and partly due to a belief on the part of foresters that they impede tree growth, and should therefore be stripped from forests. The former problem has been removed by the publication in 2006 of a standard protocol for the measurement of lianas, encouraging many new studies and allowing researchers across the world to properly compare their results. The latter belief is being dispelled by evidence that lianas are not merely structural parasites but important engines of forest dynamics and vital for the redistribution of nutrients. Far from being deleterious, current evidence suggests that forests regenerate at at least the same rate in the presence of lianas*. A cluster of lianas ascend into the canopy. These large lianas are a characteristic feature of old-growth forests in this area. Inspired by the liana book, and having noticed how little work has been done in East African forests, I now have two of my student groups doing projects on them. Their broad aims are to discern how the abundance, biomass, diversity and composition of lianas change between primary, logged and secondary forests. With just over a week to collect data we’re not going to add much to the sum total of human knowledge, but we will at least be providing some baseline data, and it’s a line of enquiry which I might follow up in the future. Maybe it will be my excuse to return to Kibale one day. While walking through the primary forest taking pictures of lianas, I happened to hear some rustling in the canopy far above me, and looked up to spot two female chimps with young! 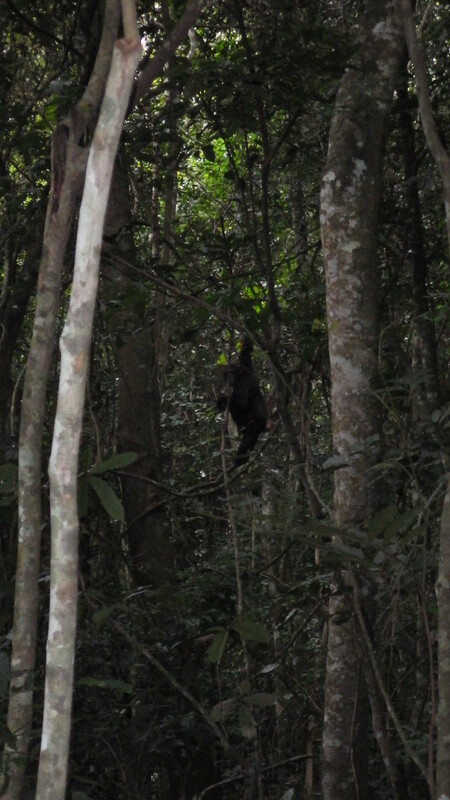 This is the first time I’ve seen chimps in the wild, and given that there were also plenty of interesting lianas in the vicinity, it seemed reasonable to stop and see what happened. After examining me carefully, and deciding that I wasn’t a threat, the chimps began gradually descending from their lofty perch, where two nests suggested that they had spent the night. For some time they paused in the sub-canopy, then eventually worked their way down to the ground and came towards me. One crossed the path carrying her baby, which dropped off her onto the trail and sat, contentedly watching me, while she rummaged through the vegetation just out of sight. The other female stopped less than ten metres away and sat playing with her baby, entirely ignoring me. Chimps also like lianas, which provide food and a means of movement around the canopy. The chimps here are thoroughly habituated to humans thanks to decades of study. Research assistants are constantly in the forest tracking them and observing their behaviour. It’s therefore one of the few places where one can get so close to chimps without any sign that they are troubled by human presence. Eventually I moved off, partly because I had other lianas to look at, but also because it was beginning to feel voyeuristic. It’s a cliché to remark on the similarity of chimps to humans, but in such close proximity it’s too striking to miss, and brings home that the savannah apes and the forest apes are not so different from one another. * I should stress that liana tangles in seriously degraded forests are a different matter. In such cases they can arrest succession and form alternative stable states that make it difficult for the forest to recover. This entry was posted in Uncategorized and tagged field notes, forest ecology, forests, lianas, Uganda on August 28, 2015 by Markus Eichhorn.